We offer lessons for anyone who’d like to learn how to ride or become a better rider. All of our horses ride Western. Along with lessons, there are also Day Camps for children 8 years of age or older. Our spacious pavilion is a great place for an outdoor event for birthday parties, family reunions, corporate outings etc. At the pavilion there is horse shoe pits, volleyball court and a grill for BBQ’s. 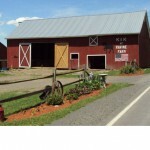 K&K offers specials on pony rides and horseback riding for parties at the pavilion.